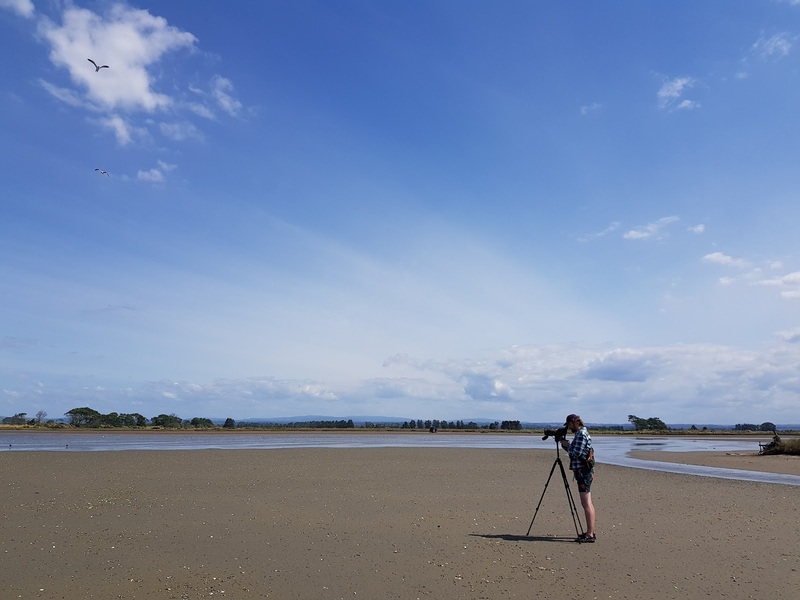 For the second December in a row, NZ birders were encouraged to get out on a specific weekend for a bit of fun competition to try and see as many birds as possible in a chosen 24 hours. This means that you can choose what time you want to start (e.g. 2pm on Saturday) and then from that point you have the next 24 hours to complete your day. This differs from the North American tradition of ‘calendar day’ big days where you must start and end at midnight. The advantage of the Kiwi-style big day is that you can use the night to cover great distances through uninteresting habitat. For example, you could have an afternoon birding around Auckland, then at night you could drive to Napier to bird the following morning, whereas in a midnight/midnight day you need to make sure your travel time is not cutting into birding time. Having said all that, it has been a very busy end to the school year for Lisa and I so I didn’t have any time to plan any elaborate routes or set up a funding campaign for a bird conservation cause (as some friends and I did last year for the Hutton’s Shearwater Charitable Trust). We also had important social engagements on the Sunday, therefore elected to still try a ‘big day’ from 2:45pm on Friday to 2:45pm on Saturday (December 15th/16th, 2017). This would technically disqualify us from the competition as we were starting early, but we still wanted to get in on the fun. 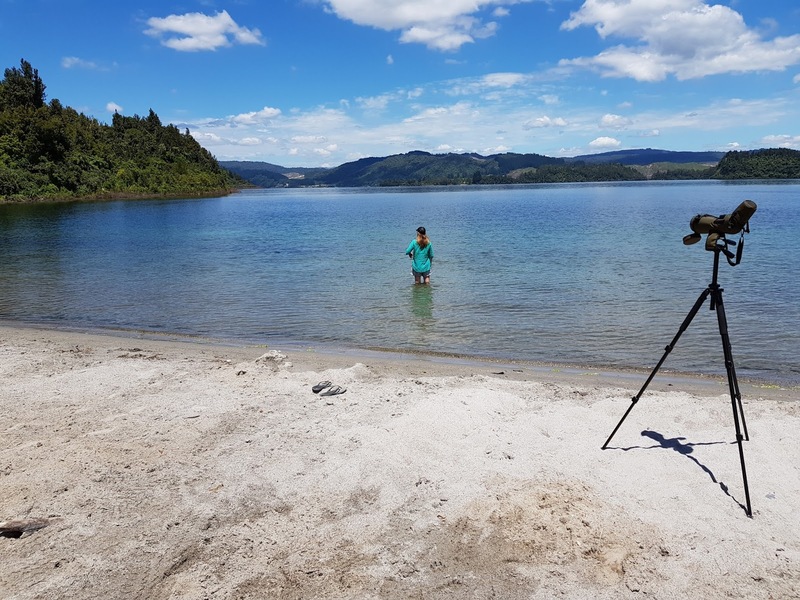 We also thought it would be a great challenge to set a new high count for the Bay of Plenty Region (which extends from Waihi Beach in the west, to East Cape in the east, and Rotorua and the northern half of Te Urewera Park in the south. Not wanting to spend our whole day driving, we decided to limit our scope to the coast between Maketu and Opotiki, and inland to the Waimana Valley and Rotorua. We would also take the rather decadent strategy of actually sleeping (for 8 full hours! )… but in a strategic spot of course. The record we were gunning for was 70, so would we make it? Read on to find out. To start, we walked out onto the mudflats of the Little Waihi Estuary (just east of Maketu). This is one of the better shorebirding sites in the Bay of Plenty, and can be easily birded at lower tides since the mud is relatively firm in most places (but not all!). The tide was rising but we wanted to make sure we got to Ohiwa Harbour with enough daylight left so unfortunately that meant being a little hurried with our Little Waihi birding. Fortunately however, the long-staying LITTLE TERN was easy to locate as were several WRYBILL and BANDED DOTTEREL in amongst the larger numbers of BAR-TAILED GODWITS and RED KNOTS. Other common harbour birds made their way onto the list along with a brief and fortuitous appearance of BANDED RAIL. Just as we were about to head back to the car, I spotted a sleeping MARSH SANDPIPER among some PIED STILTS—a bird we definitely would likely not find anywhere else. 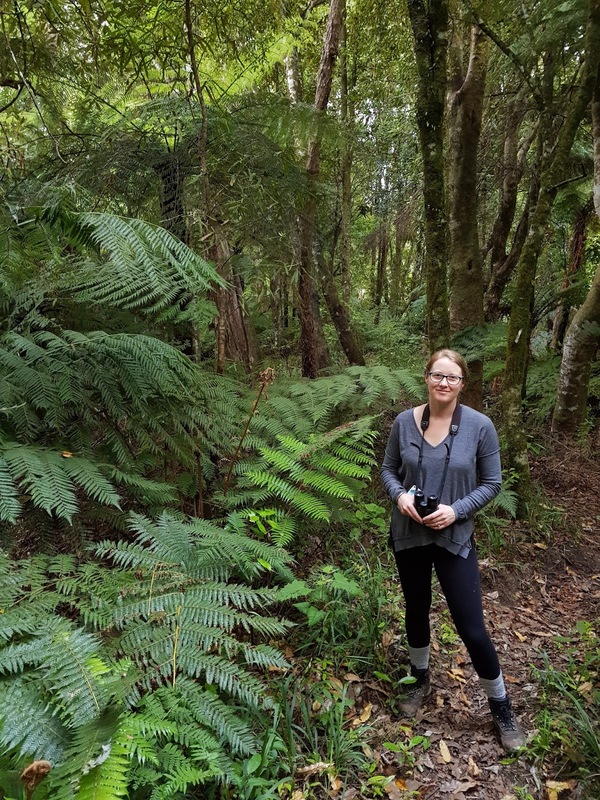 We left the Little Waihi in high spirits with a tally of 44 species. Over the hill in Maketu, we stopped at the surf club to check the WHITE-FRONTED TERN colony. Nearby 2 ARCTIC SKUA (Parasitic Jaeger) were harassing feeding terns, and a lone AUSTRALASIAN GANNET made a fly by. We checked through the Maketu waders very briefly but couldn’t manage to pick out anything new. A SPOTTED DOVE on the drive out to the highway put us on an even 50 at 4:35pm. Less than two hours in, we were feeling good. From Maketu to Whakatane, there is not a lot to look at other than dairy farms, but at least the puzzlingly curvy road (considering the terrain is completely flat) keeps you on your toes. The obvious exception is Matata though, where blooming Pohutakawas drape from a steep escarpment overlooking some freshwater lagoons behind the beach. We were in a rush but managed to pick up NZ SCAUP, FERAL GOOSE, NZ PIGEON, and a few other garden birds, then we didn’t stop until partway along Ohiwa Harbour. In the past I have reliably found Grey Duck (Pacific Black Duck) at a particular stream mouth, and sure enough, there was a pair of GREY DUCK with some more dodgy looking hybrids. The tide was clearly high so we boogied on over to the eastern part of the harbour, stopping briefly at a small shellbank along Ohiwa Loop Road. This can sometimes be a good area for whimbrel so why not check quickly? BOOM! 4 WHIMBREL roosting in a line, and what’s the smaller wader with them? WANDERING TATTLER! It’s aliiiive! Presumably this is the same tattler that has oversummered at Ohiwa for many years however last summer there were no sightings and I had assumed he/she had made their last migratory flight from the Alaskan/Yukon breeding grounds. Well maybe not! 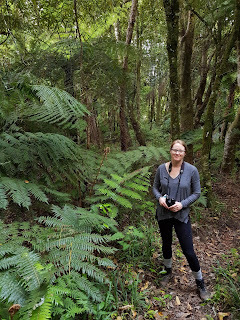 Lisa then spotted a surprise WILD TURKEY in the paddock on the other side of the road (They are surprisingly scarce in the Bay of Plenty) and we were on a mini roll! We pulled into the Ohiwa village and quickly nabbed CALIFORNIA QUAIL. Weka were playing hard to get though so we crossed the hills toward Opotiki and promptly spotted a WEKA on a recently mowed lawn. Earlier in the day we had received texts and Facebook alerts about a Laughing Gull that had been seen the previous evening in Opotiki. This was of course serendipitous as we had already been planning on having tea around Opotiki on the off-chance last year’s Laugher was still around. Knowing that we had a shot at this bird (who was apparently in full breeding plumage) was particularly exciting for Lisa as we had dipped on it in the initial days after it turned up before Xmas (I had later seen it with some friends in early Feb… the last confirmed sighting of the bird). So this was probably that bird, so had it been around this whole time? There are no birders in Opotiki and very few birders regularly visit the area outside of summer. Or had it gone north and returned? Who knows, but we wanted it! Woo, what a blocker Mom! As you can see from the photos, it was a special experience to spend our evening with the Laugher, regardless of its ‘tickability’. Fortunately, we also added some legit species with BULLER’S SHEARWATER scoped offshore and a lucky close flyby of a COMMON DIVING-PETREL. Surprisingly there were no Fluttering Shearwaters in sight but we had tomorrow to bag those. With the sun going down, we turn the steering wheel inland, and headed for the Waimana Valley, due south from Opotiki—the heart of Tuhoe country, and a section of Te Urewera bush neither Lisa and I had ever explored before. We set up the tent near Ogilvie’s Bridge, with MOREPORKs calling all around. As we began to drift off to sleep… wait we slept?! Yes we did. First time I’ve ever slept on a big day, well since I was 9 years old anyway. But things change when you turn 30 and get married and become a teacher and… at least we could maybe hear a kiwi from the tent? Anyways, where was I? As we began to drift off to sleep, a LONG-TAILED CUCKOO spiralled above our tent, screeching and ‘pit-pit-pit-ing’ putting us on 69 for the day and 1 shy of the record. We still had until 245pm the following day to chase 70. We were feeling pretty comfortable with that. Long-tailed Cuckoos woke me periodically through the night. I’m not sure why they do it, but it seems like they are a very active species in the night, as almost every time I camp in central North Island native bush in summer, I hear them calling overhead in the dead of the night. I figured there were at least 3-4 chasing each other around this night, then around 4am the first BELLBIRDS started tuning up. By 530am many other species had joined the dawn chorus, including WHITEHEAD, NORTH ISLAND ROBIN, TOMTIT, and SHINING CUCKOO. We hopped in the car and cruised down the road a bit to the Otamatuna Track head. 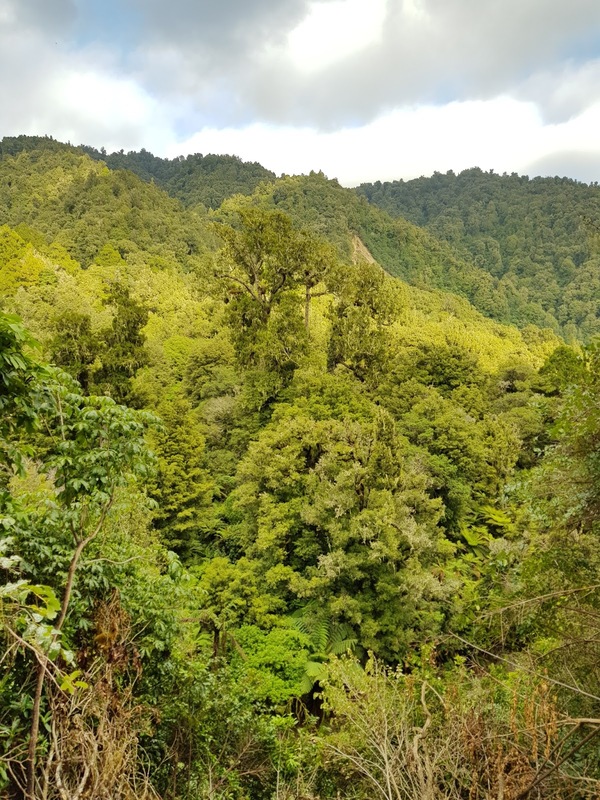 This area is a ‘mainland island’ where DOC and Tuhoe work together to trap (No 1080 is used to my knowledge) mammalian predators and keep this section of Te Urewera relatively free of pests. This track starts off very steeply but eventually gets onto a ridge of lovely tawa and rewarewa forest. Long-tailed Cuckoo were absolutely everywhere, making it the first time I’ve had easily more of them than whitehead at a site (We had at least 10 cuckoo here and only heard 2 whitehead—must be quietly nesting?). Our first KAKA was eventually heard as it flew overhead, and then multiple KOKAKO were eventually heard. We had some potential sightings close at hand but could never lock on them properly. Most of the vocalising birds appeared to be on the other side of a steep ravine so we had to be satisfied with ‘heard only.’ A pair of RIFLEMEN made a brief appearance, then further down the valley we finally picked up EASTERN ROSELLA—putting us at 77 and well and truly in new Bay of Plenty 24-hour record territory! Now we needed to push for 80. Promising ourselves that we would have to return to this beautiful valley and spend more time tramping and camping, we pried ourselves off the beautiful slopes and make our way back toward civilisation, carefully checking the river for Blue Duck… but none appeared. ‘Coffee in Whakatane’ had become the main topic of conversation for most of the morning, and so around 10am we satisfied that craving at a lovely little French café on the Strand. We took out cuppas and pasteries down to the harbour mouth to try and relocate the Reef Heron that we had seen the day before while scouting. No such luck, but we did pick up our first FLUTTERING SHEARWATERS of the day. On some oxbow ponds in town we grabbed our first COOTS, along with some dodgy Muscovy Ducks (Not counted for our list but these birds do breed in the wild, so perhaps one for future consideration). Sitting on 79, we pondered how we could get 80. We were still missing dabchick and had hoped to find one here—nope. Tried for crakes too…. Nope. Okay—Matata we need you! We had camped at Matata on Thursday night (photo from hide taken then). While we had failed to detect any Spotless Crakes, we did have both Marsh (Baillon's) Crake and bittern at night. This gave us hope on our big day. But seriously--how are there no spotless crakes out there!? 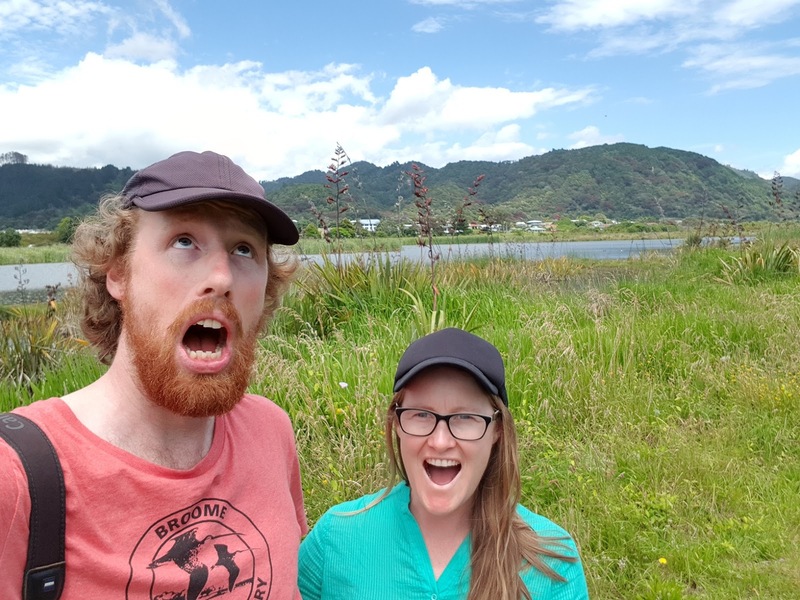 It was hot and windy when we arrived at the Matata lagoons. We needed fernbird, bittern, dabchick, and either crake… surely we could get one of those. Half an hour went by and still nothing. What is happening? This should be a crake bonanza site! FINALLY, a pair of FERNBIRD tuned up on the opposite side of the marsh. Then as we tried playing a tape for a crake, an AUSTRALASIAN BITTERN suddenly boomed directly opposite us! Wahoo—81! We had just under 3 hours to go, so decided to head for Rotorua, via some back roads in the hopes of spying a peacock or maybe a random rook. Neither of those presented themselves but we found a fabulous swim spot in the NE corner of Lake Rotoma, a place we’ll need to revisit. Long-tailed Cuckoo were calling here as well, but no dabchick on the lake. We continued west along the north shore of the lake, then stopped at a good-looking wetland on the east side of Lake Rotoehu. Another pair of Fernbird were already calling when we stepped out of the car and no less than 2 SPOTTLESS CRAKES began calling in short order. And oh look, there’s a dabchick! 83 species. Off to Rotorua for lunch and a final hour to look for falcon and I dunno… maybe a Black-fronted Dotterel? Things were obviously starting to get a little loopy when I asked Lisa to turn around to check out what I thought might be a Mute Swan on a golf course... it was a goat! I have a feeling this will be 'Exhibit A' in any future ID debates. Grabbed some subway and headed to the Redwoods, hoping for a chance NZ Falcon flyby as they supposedly reside here. No such luck, let’s try the same at Sulphur Pt and scan around. No falcon but hey—REDPOLLS! We had forgot we were still missing them. A nice bonus push to 84 (Not including the gull). We still had 15 minutes left but try as we might, no falcon presented itself, and we couldn’t bring ourselves to count the Mute Swan inside Rainbow Springs. So the clock ticked over to 245pm and that was that! What a fun day in the Bay of Plenty, exploring new places and enjoying great summer weather. We’ll definitely have to try a similar route again some day. Misses for the day were (That are reasonably possible on our route): Brown Kiwi, Peafowl, Brown Quail, Blue Duck, Ruddy Turnstone, Sharp-tailed Sandpiper, NZ Falcon, Yellow-crowned Parakeet, and Australasian Pipit. I'm afraid the clock just keeps tickin' while work and play keeps me busy. That means 'Part 2' of our Sri Lanka honeymoon will be fairly abbreviated, even by my standards. We last left off in central Sri Lanka, at the famous Sigiriya Rock. This chapter sees us travel south into the hill country of Sri Lanka, and eventually up to some of the highest plateaus where misty mountains are cloaked in tea plantations and the odd bit of native bush with a bird or two. After meeting our new driver, 'Sasi,' (Who turned out to be an awesome guy--wish he could have been with us for the entire trip! ), we headed SW to the nearby city of Dambulla. Here, as you can see, is the famous 'Golden Temple.' This Buddha is massive (See the guy at the bottom of the stairs) as are the fake lotus flowers that line the building. Tacky or not, it is a spectacle, but it's not even the most famous landmark here! Up on the ridge to the right, after a sweaty climb, are a series of ancient cave temples with some incredible artwork and... yep more Buddhas! After a lunch break, Sasi took us to this lovely temple--Nalanda Gedige (I've cropped out all the construction signs) which is surrounded by a lake. This structure was built in the 8th century by in the Dravidian style by Hindus but was later used (and still is) as a Buddhist temple. In this part of Sri Lanka it is actually quite common for the 4 main faiths (Buddhism, Hinduism, Islam, and Christianity) to share buildings or Holy sites, and the locals seem quite proud of this diversity and tolerance. Many foreigners, myself included, would find this surprising given the decades of violence between Hindu Tamils in the north and the ruling (mostly Buddhist) Sinhalese. Fun fact though, there are actually more Muslims in Sri Lanka than Hindus. Anyway, back to this lovely place of tranquility, its other claim to fame is that it has the only example of Tantric art in Sri Lanka (You know... Kama Sutra-type stuff). Before you get excited though, the rock carvings are so old and weathered it's pretty hard to tell what is going on. Birds were doing their thing around the temple. Our only Green Warblers of the trip were here; Black-hooded Orioles were conspicuous, and this Yellow-billed Babbler popped up for the camera. There were 3 species of kingfisher in this tree: Stork-billed, Common, and this White-throated. We rolled into Kandy in the afternoon. Known as Sri Lanka's "Second City" or "Cultural Capital" it was, for a time, the political capital of a short-lived kingdom that, among other things, tried unsuccessfully to resit British Imperialism. This is Kandy Lake, with the King's old boat house toward the right, and in behind this, is the famous "Temple of the Tooth"--one of the most sacred Buddhist locations in the world, as it allegedly houses one of Buddha's teeth. We happened to be visiting during a full moon festival, so the temple grounds were packed with white-dressed worshipers... and awkward tourists like us. A good profile comparison of Sri Lanka's two crow species: Large-billed (left) and House (right). According to the field guide, House Crow is only found on the coast, but there were easily over 1,000 roosting at Kandy Lake each evening so I think that needs updating! A pair of crows inspect a row of 'tuk-tuks' (The main mode of transport in Sri Lanka). This is also a good example of the British colonial era buildings that can be found in most Sri Lankan cities. Lisa walking toward the Temple of the Tooth. As Kandy is a little higher in elevation, the heat and humidity is a little more bearable than it was at Sigiriya and Dambulla. Another tidbit: To enter these holy sites, one must be covered on the shoulders and down toward the ankles (And when you get close to remove hats and shoes). Apparently my sarong-tying skills needed work as I was felt up many times by armed policemen, before being shown how to re-wrap. Looking back through the entrance of the Temple of the Tooth. How are we allowed in here during a Buddhist ceremony? Somewhere within that golden door is a Russian-nesting doll-style set of chests, within lies one of Buddha's teeth. Flower offerings cloak the table in the foreground. It is hard not to feel like you shouldn't be hear with so many devout Buddhists carrying out rituals such as meditation and prayer while you stride around in the same forum taking pictures. Here a loud guide speaks in Italian to her tour group while a number of East Asian pilgrims pray in what I like to call, "the golden elephant room." This celtic cross appears out of place in bustling Kandy. A closer look reveals that it commemorates Sri Lanka's (Then British Ceylon) contributions in WWI. All of the names appeared English and Scottish--likely the sons of tea plantation owners. This photo doesn't really do the place justice, but we really enjoyed visiting Udawatta Kele sanctuary in Kandy. This forest park covers a ridge directly behind the temple of the tooth, and though it is in the heart of the city, the only sounds you hear are from birds and monkeys, and the odd deer skittering away through dry leaves. This forest was originally a plantation to feed the kings elephants, then as the forest matured it became a favourite place for the royal family to stroll and bathe. Apparently Lord Horton (An early British Governor) had a wife who enjoyed taking the car out for a spit on bush tracks like this one. Birdlife encountered on our morning walk included seeing the endemic Layard's Parakeet, the Sri Lankan ssp. of Square-tailed (Black) Bulbul, great looks at White-rumped Shama and Brown-capped Babbler, as well as our first Pale-billed Flowerpecker. In the afternoon on our second day in Kandy, we took a tuk-tuk out to the botanical gardens. This massive complex is well-worth the visit, though the only photos I took were of the resident flying-foxes. Apparently 24,000+ roost in the gardens daily! I'm really speeding ahead here, but after a great 3 days in Kandy, we were tired of the exhaust fumes of the city--it was time to hit the real hills! Fortunately Sasi had agreed to take us to Nuwara Eliya where we would catch a train through the tea country to the small tourist town of Ella. Along the way he stopped to show us some large porcupine quills. Apparently Kandy has some very large porcupines that come out at night to chew on coconuts. We arrived in Nuwara Eliya (Spelling always changes in Sri Lanka it seems) just before lunch. It was a cool day (Felt like under 10 degrees with the wind!) and not surprising as this is Sri Lanka's highest town. The post office, looking rather British. This was a favourite place for British tea workers to escape the Sri Lankan heat for a bit. The place is known for its misty hills, regular rain, AND it has a golf course and horse track (Rarities in this country). For birders it is famous for some Himalayan breeders that spend the winter at the local 'Victoria Park'--particularly Kashmir Flycatcher and Pied Thrush. Would we get them with only 1 hour to spare before the train? Not a Kashmir Flycatcher, but still new for me--a Brown-breasted Flycatcher. This is a juvenile Brown Shrike (Showing greyer cap and back) is of the 'Philippine' subspecies, which misleadingly breeds in NE China and Korea. Aha! Male Pied Thrush (A member of the 'Turdus' genus, like American Robin and European Blackbird). Another new one: This is a Sri Lankan White-eye. Sadly we dipped on the Kashmir Flycatcher but I did get my lifer Forest Wagtails which was majorly cool! Wow, I'm skipping ahead. We ended up missing the first train, having a dodgy noodle lunch at a place called "The Muslin Hotel" which was basically a hole in the wall with food scraps and flies covering the floor, waited around for a bit, then eventually got on the next train for Ella. Wahoo! The Kandy--Ella train route is world-famous among train lovers. It's certainly scenic and because it lacks the safety measures of Canadian/NZ trains, you can hang out doorways and windows to your heart's content (If that's what you're into). Make sure you're on the faster blue trains though, as we found out--the red ones stop for 30-40 minutes at each station to wait for the other trains to pass. Ella turned out to be quite touristy indeed, sort of a mini Banff (or Queenstown for my NZ readers). But a bit of Western food for a change was kind of nice. The following morning we made the mandatory pilgrimage of 'Little Adams Peak' (a fake name for a local hill, referencing Sri Pada--or Adam's Peak--which is where some believe Adam first came down from the Garden of Eden. It's also a major Buddhist site as the Buddha himself stayed there for a time). Anyway, this place is still pretty cool as it offers 360 views of the surrounding tea country. Oh ya--and we had some great birds including the stonking Red-backed Flameback (As opposed to its coastal cousin that sports a golden back). After the hike we had breakfast on the third floor of our hotel--a great place to watch Sri Lankan Hanging Parrots feeding. From Ella, we trained back to the small village of Ohiwa where a tuktuk driver took us over the hill, then down a very steep, switch-backy, very rough, track to the "Hill Safari Eco Lodge." This place is up around 2000m on a high plateau known as the "Horton Plains"--very Sri Lankan-sounding. The weather here is pretty much the same year-round. Cold clear early mornings, warm sunny late mornings, then a thick fog comes up from the lowlands (as the tropical heat pushes moisture up) and cloaks these hills in thick cloud. When we arrive at Hill Safari (Which is on a large active tea plantation), the fog was so thick that visibility was less than 50 m). As dusk approached, the rain set in, apparently for the first time in 5 months, and dined with some Danes and Germans who lamented about the declining quality of Sri Lankan beer in recent years. The following morning we rose before dawn, and were driven by tuk-tuk (this time we could see how far down the drop was if we went off the road), to the entrance of Horton Plains National Park. This is a beautiful area of high country moorlands and rhododendron forest that is quite unlike the rest of Sri Lanka. As you can see from the photos, it bears a striking resemblance to the beech forests and tussock country of the South Island in NZ. As we approached the start of the park's famous hike "To World's End" we spotted several Sambar Deer, but sadly no leopards. As in NZ, this area suffers from invasive plant-species brought by the British--mainly gorse, blackberry, and a bracken fern. Intensive mangagement is starting to pay off though, and the native dwarf bamboo is making a comeback along creeks and small wetlands. There are several endemic birds found only in this small area--including the secretive Sri Lankan Whistling-Thrush (Which we did not see). A female Pied Bushchat poses on one of the remaining gorse bushes. This is called "Little World's End" though I thought this was just as impressive a few as "World's End." The clouds stretching out on the horizon hide the Sri Lankan coastline that is just over 100 km away. A male Pied Bushchat in a rhodo. These birds are not shy. Paddyfield Pipit (I think)--and no I did not measure its hindclaw. One of the better birds we 'found' on the trip. This Pallas's Grasshopper-Warbler is a fairly scarce migrant to Sri Lanka. After our half-day hike in the park, we returned to the lodge for a relaxing afternoon. Here we see the place for the first time without fog (It covered the lodge about 1 minute after I took this photo). Birding highlight around the lodge was a female Kashmir Flycatcher--nice to get after dipping at Victoria Park. Other common birds in the tea bushes included Blyth's Reed-Warbler, Common Tailorbird, Ashy Prinia, and Pied Bushchat. The stunning view from the lodge (before 11am when the fog rolled in). Below you can see a Tamil village. These Tamil Hindus were brought over from India 100+ years ago to pick the tea. They are different to the Tamils in the north that have lived in Sri Lanka just as long as the Buddhist Sinhalese. Therefore you see a lot of Tamils in the central highlands of this country but they had no affiliation with the 'Tamil Tigers' movement. So that was Part 2! Apologies for it being brief and kind of jumping around everywhere but that's all I have time for I'm afraid. Join me for Part 3 (At some point), for the final chapter where we visit some pristine jungle in Sinharaja to try to catch up on endemic birds and other jungle critters before hitting the coast for our final 4 days of the trip. Still lots of cool birds to come! Although I enjoy travelling far and wide, the Okanagan Valley is where I reside!